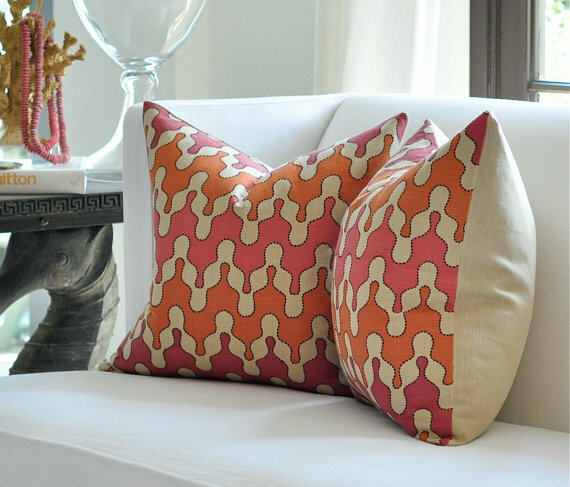 One more post about pillows...also inspired by Mary Ann of Classic Casual Home. I love it when special fabrics speak to me. The only place I can imagine using this right now is our daughter's apartment that we have been working on. She has the orange wall behind her bed but we have already purchased an orange Greek key design pillow for her bed that looks great. I am too practical to replace something quickly. Liana is offering a pair of them on her Etsy shop here. Is anyone else as crazy for this fabric as I am? Ha! You know I like them...I missed that they were on the Lonny chairs. The fabric actually has black stitching...nice. I love the combination of pink and orange - get them for your daughter! I love lots of pillows. Maybe she needs a chair instead of a pillow! :) What a gorgeous statement it makes!